Although she is strong-willed at times,she is always loyal and makes it her top priority to make sure I am happy, even when I have had a bad day. She can quickly turn a frown to a smile! It's also funny how she has influenced the lives of other family members, and managed to steal their hearts as well. She is even invited to grandma and grandpa's house for dinner because she is so well-mannered and disciplined. She really knows how to be on her best behavior, as well as being able to get what she wants. I have never seen another dog get so excited for Christmas like her. She can't wait for Christmas morning to come to be able to open all her presents. We even have to keep them hidden until the night before! She will be 12 years young this December, and does not act much different than when she was just a puppy. The only main difference is that she has matured over the years. She is my little baby and I absolutely love being able to spend so much time with her. Comments for My little bundle of joy! I know Sammie personally and everything Brittany is saying is right on and then some. Sammie is a great dog! She's cute and very obedient. I think it's great Brittany can take Sammie with her to work and the co-workers can enjoy Sammie. Not only is Sammie lucky to have Brittany and her family, but the family is very lucky to have Sammie! 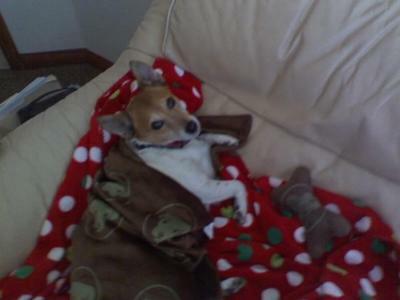 Another super little JRT,and for her to share her day with you at work is lovely,she looks as though she is spiolt too with those lovely warm covers., and why not.